Jumping is the only thing to do in Canabalt, but the game's aesthetics imbue the action with excitement. The game starts by giving the player control over the jumps of a small person making a mad dash across the rooftops of an anonymous city. The character's frantic pace is quickly explained when ominous silhouettes of enormous robots begin to appear in the background and proceed to wreck the place. Fighter pilots zoom past, buildings crumble, errant missiles threaten the little runner's existence, and all the player can do is try to jump out of danger. Why are there giant robots? Who called in the jets? Is the little person trying to escape the danger or are they running towards an awaiting mech in order to join the fray? None of these questions are answered, but the fact that they arise shows the power of art and storytelling in games. A game in which the player has to press a button within one second of a light going off would be almost mechanically identical, but the fantastic presentation gives the actions context. The game has no real ending besides the player losing, and its randomly-generated obstacles add an element of luck to the game that can even the most promising runs short. However, subtle elements like a near-instantaneous respawn time and the continuous, upbeat soundtrack lessens the sting of failure. The same techniques were employed in 2010's similarly punishing game, Super Meat Boy. Viewed on a larger scale, Canabalt demonstrates some of the larger trends in the video game medium in terms of how games are marketed and played. In 2009, my Twitter feed was flooded with people uploading their latest scores. Canabalt fostered a kind of virtual arcade community; In the 1980s and 90s, people would hang around an arcade to watch other players and check out the latest leader boards. Canabalt moved the venue to the Internet but managed to retain the same potential to turn a single player game into a social experience. Canabalt is a social game in the pre-Facebook sense of the term; rather than trying to convert friends into gameplay mechanics, it leaves the task of socializing up to the players. That a small game garnered so much press is also a testament to impact of the Internet and more specifically Apple App Store. Without the word of mouth that comes from social media and the relative accessibility of the App Store, this charming title would likely have joined the ranks of countless other high-quality, yet overlooked browser games. 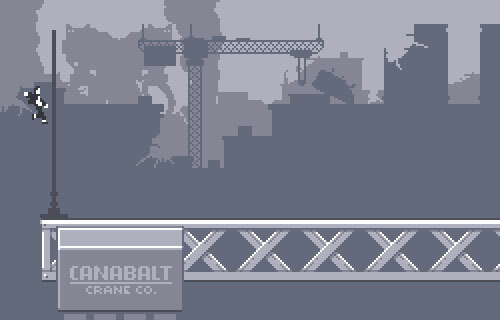 This would have been a shame, as Canabalt is an elegant mix of mechanics, storytelling, and social gaming. Whenever I feel burned out, its combination of challenge, competition, and giant robots perks me right up. I think simplicity is a big reason why indie titles are getting alot more press now and days. With bigger titles featuring the latest 3-D characters and environments something is bound to fall through the cracks. Not to say that AAA titles are bad but they lack the coehisive goal that smaller studios have. I still keep the demo on my hard drive so that I can go on the occasional run. Hopefully we'll get our sequel someday! Good point. Add that to the fact that big studios must please so many masters: publishers, investors, contract artists, conflicting egos, etc. It's kind of amazing that a huge game like GTA ever gets made!